Looking for an exciting new racing game that’s easy to learn, yet loaded with realistic physics and graphics, real-life cars, and the option to race against actual human opponents, apart from the usual AI drivers? 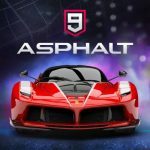 Asphalt 9: Legends may be the game for you, and it comes to you via Gameloft, one of the biggest and best-known mobile game makers out there, and the makers of the Asphalt series, as well as other titles such as the Dungeon Hunter series, and even more casual games like Despicable Me: Minion Rush. Currently, Asphalt 9: Legends is available only for iOS devices, though an Android version is coming soon for those who own Samsung, LG, or other Android-powered devices. As mentioned, the game comes with a ton of real-life cars, including supercars and hypercars from Ferrari, Lamborghini, Porsche, and other iconic automakers, a customization system that allows you to choose the colors and upgrades you want for your cars (and even their parts), and simple game mechanics that don’t try and force you to put in too much effort into the learning process. However, that doesn’t mean that this game will always be a walk in the park. On the contrary – after you complete the first few races, it may become harder to collect all the flags needed to make it from one part of campaign to the next. So with that in mind, we’ve come up with an Asphalt 9: Legends strategy guide for the beginners out there – may you be new to the game, or new to the Asphalt series. We’re here to help you win and help you unlock more cars, so read on if you’re looking to do that and more! Compared to other racing games of this kind, Asphalt 9: Legends doesn’t make it too hard for you to drive. By default, the game controls the steering for you, and automatically takes care of acceleration and braking, leaving you to focus on only two things – hitting the drift or nitro buttons at the right time. That’s all there is to navigating the courses in this game, although you’ll need to make sure you time your drifts perfectly, and use your nitro in the right way in order to improve your chances of winning. Holding on the drift button found on the left side of the screen allows you to drift, with a longer hold meaning a longer drift, and shorter taps allowing you to make a slight left or right turn, and tapping on the nitro button on the right activates your nitro and gives you a quick burst of speed. Also keep in mind that drifting refills your nitro bar; although the game will automatically steer by default, you can’t expect to make the most out of your nitro if you don’t do any drifts! In order to unlock new cars in this game, you’re going to need to complete a set of blueprints, which can be collected as rewards for finishing first place in races, or as part of the packs you can get for free or buy for in-game currency at the store. You start the game out with a Mitsubishi Lancer Evolution, but regardless of the car, or its tier, you’ll need to upgrade it regularly if you want to have an edge over the competition, may it be AI drivers or human opponents. 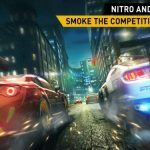 Drifting is a sure way to increase your nitro bar in Asphalt 9: Legends, as we explained above. But there is another way in which you can add to your nitro bar quickly, and that’s by quickly tapping twice on the drift button to do a 360 spin. This may drop you back a bit in races, but the advantage of doing this is that you get a big boost to your nitro, somewhere along the lines of a third to 40 percent of the bar refilled instantly by doing this trick. As this is a trick that could set you back, or send you careening into another vehicle, we must remind you to only do a 360 at the right time – if you’re substantially behind or ahead of the rest of the pack, and if your nitro bar is at less than 50 percent. We say both conditions need to be met before you make your car spin 360 degrees, as you don’t want to be hotdogging it out there when you’re holding on to a slim lead or trying to gain some ground on the leaders, with a full bar of nitro that can take care of that for you by extending your lead or helping you catch up. Then again, you don’t have to drift all the time or do fancy tricks in order to fill up your nitro bar. At random points on any track, you’ll see blue or gold cans of nitro in outline form; driving into them will add to your nitro bar, with the gold cans giving you a bigger increase than the blue cans. We wouldn’t recommend that you go out of your way to chase these cans of nitro, if it means increasing your chances of bumping into objects or other cars. But if you see them directly ahead of you, then by all means, drive into them, as using your nitro plays a bigger role than usual in improving your chances of winning. 4. How Do Perfect Nitro And Pulse Nitro Work? The game will notify you at some point in the first “season” of campaign mode that there are more ways than one to use your nitro. Aside from the ordinary way in which you activate your nitro, you’ve got Perfect Nitro, which you can activate by tapping the nitro once, then waiting until the bar hits the small blue line before tapping a second time. Pulse Nitro, on the other hand, requires that you tap once, then tap a second time on the even smaller purple line that comes before the blue one on your nitro bar. How do these two differ from each other? As far as we’ve seen Pulse Nitro offers a bigger speed boost than Perfect Nitro, though it doesn’t last as long as the latter. Either way, why should you settle for ordinary, garden variety nitro when you have a chance to up the ante with Pulse or Perfect Nitro? After each race, you’ll see a list of achievements you can complete – you may need to travel a certain distance, win a certain number of times, or perform so many 360’s or use so many nitrous boosts. These are just some of the many achievements you can complete in Asphalt 9: Legends, and completing them will earn you some tokens, which are the game’s premium currency. Tokens can be used to purchase card packs – a premium pack will cost you 65 each – or to buy blueprints in the Legends Store. There are also special offers, where you can pay coins and tokens to buy rare, high-end cars in full form, with no need for blueprints. Just keep playing the game like you normally would, and those tokens will be adding up; if you pay attention to the requirements of each achievement, you can keep those in mind the next time you play, and race in such a way that you can complete them faster! Flags are awarded each time you complete a challenge or requirement in a race (you don’t necessarily have to win it), and those flags will be important, as they allow you to progress from one season to the next. 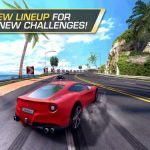 But aside from that, flags can unlock the game’s other modes, including Clubs (10 flags), which are Asphalt 9: Legends’s answer to guilds in role-playing games, Events (15 flags), which allow you to win special prizes in limited-time races that may be harder than the ones you got to complete on campaign mode, and Multiplayer (20 flags), which is exactly how it’s described on the label, as the expression goes – a chance to race against human players. Just as a disclaimer, you won’t be able to get much loot from the free packs, but every four hours or so, the game will allow you to open free packs, which contain one or two cards that generally contain blueprints. Ad packs, on the other hand, contain coins or tokens, and can be redeemed any time at the in-game shop by clicking on the “Play” button underneath the Ad Pack image and watching a video. If you have enough tokens, you can also buy a Premium Pack, which also comes with blueprints inside, but in greater quantity – you get a guaranteed three cards per Premium Pack, and the content is generally rarer than what you’d get from the free Classic Pack. It goes without saying that you’ll need to upgrade your car, preferably so its rating is a few points above the recommended rating for a given track. But when it comes to specific areas you need to be upgrading, it would all depend on the car – generally, working on its weakest area, or areas is best recommended. The upgrades, thankfully, aren’t too complicated – upgrade Top Speed and Nitro if you’re trying to improve your car’s speed, and upgrade Acceleration and Handling if you want it to maneuver better on the track. There are also parts which you can install to further improve a certain stat, though you probably won’t encounter them too often – they’re available inside card packs, and can be won in campaign races, but this won’t happen too often, as far as we’ve seen so far. Those upgrades will get more expensive as you progressively level up each of the four stats; your coins will mostly go to the individual stat upgrades per car, and you might find yourself running out of them sooner rather than later. So what’s to do if you’re looking to earn more money for those all-important upgrades? The answer would be to replay races you’ve already completed in order to earn some quick and easy coins. You won’t earn as much as you did the first time around, as the onetime bonus for earning a flag will no longer apply. But as long as you’ve got enough gas, grinding it out is a good way to add to your coin totals, especially if you haven’t collected all the possible flags. As for refilling your gas, each unit of gas refills every five minutes, though you will also have the option to refill your entire tank in just five minutes, regardless if it’s completely empty. 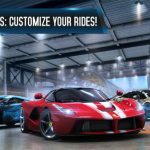 When talking about the basics of winning races in Asphalt 9: Legends, there are a few things you need to remember if you’re looking to collect those flags and complete those challenges. Revisiting what we had told you earlier, completing a challenge won’t always require you to win a race. You may finish first place, but if you don’t complete the race in 50 seconds, if required, you won’t get a flag for that. Take note of the requirements and work toward meeting them – flags allow you to move from one season to another, and, if you’re still in the early stages, allow you to unlock more game modes! As for the actual races, it’s important that you’re mindful of your nitro bar. Don’t let it sit for too long while completely filled up, because that’s a shortcut to getting overtaken by a slew of cars. Neither should you let it sit empty for too long! Drifting, pulling off tricks such as 360’s, barrel rolls, and flying off ramps will fill up your nitro bar, so you may resort to that if you need to fill up your nitro bar quickly. Bumping into cars or objects will slow you down, and while you will complete certain achievements by bumping into a given number of cars or objects, or knocking cars out, this generally won’t do you any good if you’re chasing first place. Tap gently on the drift button to move out of the way, but don’t make those taps in quick succession, because your car might end up doing a 360 inadvertently! Also, going off ramps could also help you move ahead of the pack, or increase your lead, though if your car has TouchDrive (automatic steering, acceleration, and brakes) activated, you might not be able to reach them if they’re out of the way.